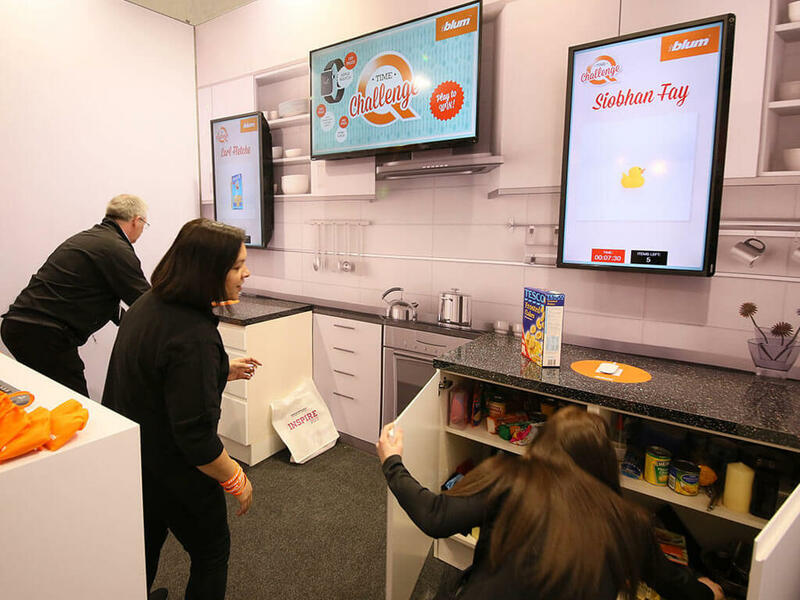 Blum, an international furniture fittings company, wanted to demonstrate the storage and usability benefits of drawers as opposed to the traditional kitchen cupboard. 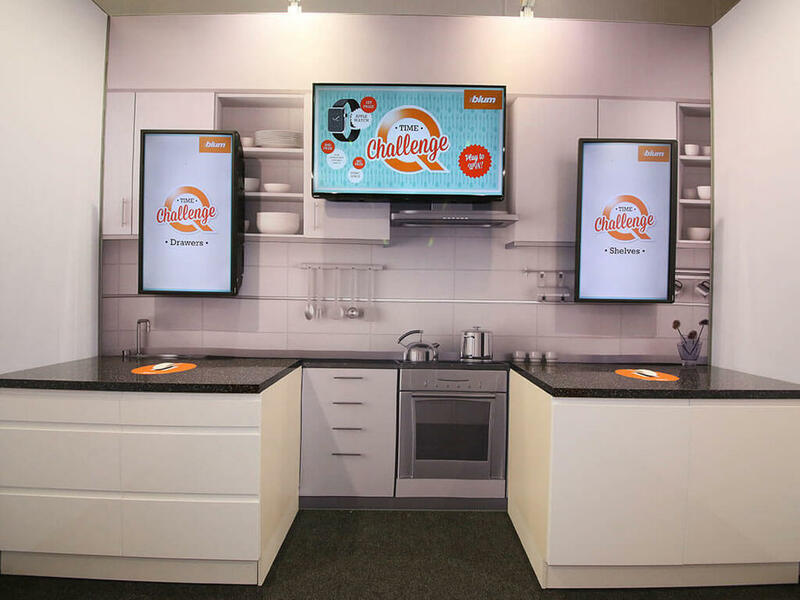 Exhibiting at an internal event for one of their distributers, Travis Perkins, the brief was to design a stand that would showcase the benefits of their kitchen drawer systems to Travis Perkins’ sales staff. Our solution was to produce a mock interior of a kitchen using a back wall graphic aligned with drawer and cupboard units. The rear of the stand was then dedicated to a unique ‘phygital’ game. Two AV screens instructed players to find objects against the clock, one player using drawers with Blum’s fittings and the other using the traditional cupboard kitchen unit. A third screen was placed in the middle to display the countdown clock and leaderboard creating a competitive element of the game. 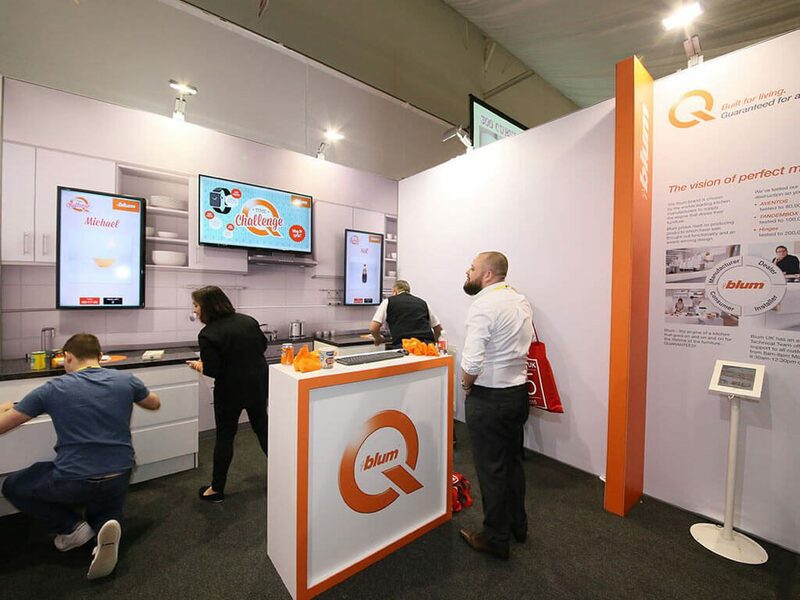 The remaining stand was constructed from bespoke hire architecture to keep costs to a minimum whilst the ‘phygital’ game enabled Blum to maximise their exhibiting ROI. 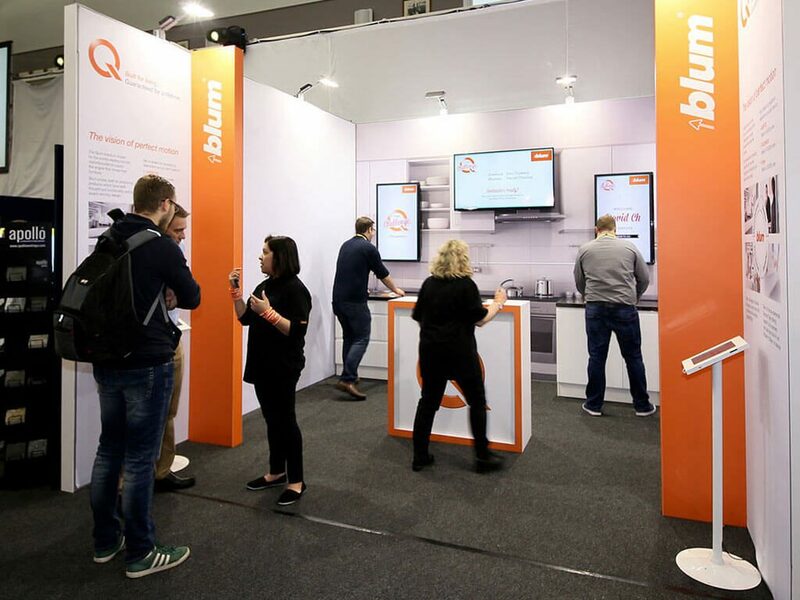 A total of 204 people visited the Blum stand with over 50 people playing the game each day. 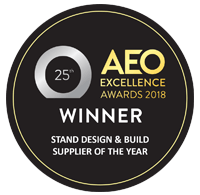 The game became a focal point of the whole event, and Blum were pleased with the way it had engaged the audience, meeting their objective of showcasing the ease of use and quality of their products over traditional alternatives. “We are not new to exhibitions and shows, but this concept was something completely different to anything we have done in the past. The reaction to the game was absolutely fantastic and meant the energy levels at our stand were at a constant high. The game was so good that people queued to play and some visited 3-4 times to try to get onto the leader board.